So, instead of going to the gym first thing when I got home, I turned on my computer. I wanted to run my anti-virus software. Then I looked at my blog, I decided I wanted to send pictures from my phone to this blog so I tried to set it up. I sent a text message to go@blogger.com and they sent me a reply. When they sent it, my phone turned off. I turned my phone back on and I couldn’t open the text message. The phone would either freeze or turn off. So I took it to the Verizon store. The tech guy said sometimes when you get an e-mail you also get a virus and that is why the phone freezes up. He tried to reset it but couldn’t so he ordered me a new phone. He said it should be in Wednesday. I still have the old phone but I have to open text messages when I get them because I can’t get to them later. I tried sending a picture but it didn’t work. Well, I guess I should go now. I am tired and need my sleep. I just messed up my phone by trying to set it up to this blog for mobile blogging. I had sent this to my other blog, so I now have linked it. 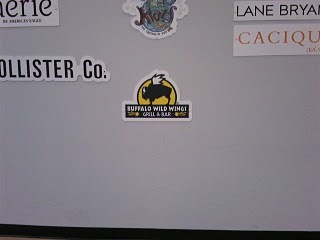 It supports B.T.’s claim that Buffalo have wings. Gwen and I went to see August Rush and I spent all day yesterday trying to get online to add it to my list. This is the first I have been able to get online and now I have to rush to get ready for work.